Police Officer David Frank Mobilio ~ Gone, but never forgotten! 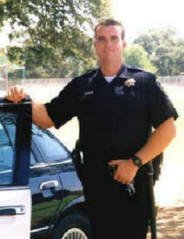 In 1998 Officer David Mobilio was appointed to the patrol division of the Red Bluff Police Department. In addition to his patrol duties, David acted as the liaison officer for DARE (Drug Abuse Resistance Education) at local elementary schools. He dedicated much time and energy to teaching children how to make good choices in life. In 2003, the Tehama County Police Activities League began the Officer David F. Mobilio/PAL Scholarship in memory of Officer Mobilio who gave his life in the line of duty on November 19, 2002. Graduating seniors are eligible to apply. One scholarship is awarded to each of the four high school districts within Tehama County (Corning, Los Molinos, Mercy and Red Bluff). These scholarships are made possible through donations and fundraising efforts. The scholarship application will be available in March of each year. You can access the scholarship application by clicking on the button below. Just print the form, complete it and return it by the deadline date to the address listed on the application. For more information regarding this scholarship please call Kathy Hausman at (530) 529-7950. This scholarship application is currently closed and will re-open in March of 2020.